Transatantic Blonde‘s #FeministFriday linky is traveling and has pitched its tent here at Circus Queen this week. Please add links to your feminist posts below. The linky will remain open for one week. If you’d like to host #FeministFriday one week, contact Blondie. I was going to blog about how attachment parenting and feminism fit together but life got in the way. For a few reasons, this has been a difficult week for me, not least because I am struggling with my identity as mother. Again. So I’m really looking forward to reading your posts and being reminded of how strong women are. In the meantime, here’s a thrilling guest post written for Circus Queen by my dear friend Kath Cunningham, who blogs at The Long Walk Home. Kath lives in Brighton, writes about the Christian faith and is married to Talitha’s Godfather. They are expecting a baby later this year. As it was a topic that came up at Cybher, I asked Kath to blog about how faith and feminism fit together. She obliged surprisingly quickly. Please let us both know what you think in the comments and go have a look around at the other #FeministFriday posts in the linky when you’re through. This weekend we spent some lovely time with the wonderful JK’s, Adele, Laz and the delightful Talitha. Both Adele and I were away in different places for the Saturday, leaving the men to be a perfect Brighton couple with their obviously adopted mixed race baby. I would have enjoyed observing the admiring looks. Adele came back with many tales from the Cybher blogging conference and mentioned an off the cuff comment one of the other bloggers had made about faith being incompatible with feminism. Adele gladly put the record straight and then tasked me to write a guest post about how faith and feminism actually go hand in hand. All of which has led me to some soul searching to discover what I really think about this issue. To talk about this with any kind of vague sense I need to define some terms. The faith we’re talking about is the Christian one, with, yes, its rather checkered history when it comes to women, although I think the whole of history has to be held to account on this issue. As for feminism, there are a whole raft of definitions that come with that rather loaded word, a whole load of perspectives to take into account. I’m aware that there are as many different nuances in the world of feminism as there are in the world of Christianity. This might pose me with somewhat of a dilemma unless I plough on regardless and proffer some personal thoughts into the mix of how I’ve come to see the wonderful compatibility of these two worlds. This isn’t a book or a thesis, it’s just how I see things right now. My first bout of soul searching left me wondering if I even considered myself a feminist. I’ve never really felt the need to attach that label to myself. After some thought I think at the base level I see no other answer than a resounding yes. Of course I am. I’m a woman, why am I not going to seek equality for women, reject the abuse of women over the years, seek to fight trafficking in all its hideousness, reject domestic abuse and the pathetic attempts to patronise and look down on women. I think there are many abuses of the term feminist, by men who are scared, by women who would rather have a world without men and by anyone who tries to relegate it to a humorous stereotype, thus dismissing a vitally important movement. But you know, I like men, I love them in fact, I don’t think my feminism is incompatible with that, I am equally discomforted by comments designed to patronise men and look down on them. I worry that some Mummy blogs I have read seem to treat their other halves with the same contempt as the family pet. I hate the view of men that sees them as incompetent fools rather than gloriously different members of the human race. The answer to centuries of discrimination, abuse and general ignorance about our gender isn’t to seek revenge. However tempting that may seem. So where does faith come into it? Have I just submitted myself to a patriarchal religion which values the man over the woman and do I degrade myself and my gender by being in a church which seems so anachronistic when it comes to these issues? Well maybe, but Jesus gives me hope in the midst of all this, and believe it or not, so does the apostle Paul (a well-known target of hate for feminists inside the church and out). Just try reading through Luke’s gospel. Put yourself in the culture, where people thanked God that they weren’t born a woman. Imagine a man walking around in that time. Surely he would be exclusively with the other men, the important ones. As a single man he might not encounter any women in his day. There were even different sections of the temple for men and women. Women weren’t expected to learn anything. They were outcasts, the overlooked, the ones to be ushered out of the way back into the kitchen. And here comes Jesus. What does he do? He hangs out with women. We do ourselves a disservice if we miss the shock here. He teaches women, he treats them with dignity and respect, he heals and helps them, he lets them pour perfume out on his feet, he loves their company, he accepts their help and he calls them out of the kitchen to sit at his feet and soak up life with him. I can’t imagine what it must have been like to experience such respect and tenderness from a teacher, from a man. Whatever you think about Paul’s teaching on women, and please bear in mind the cultural context, he actually sets up a whole new level of behaviour between the genders: husbands are to love their wives, to see them as people who are worthy of learning, to treat them with self-sacrificial love. Again, we miss the surprise, the shock, the call to live beyond the surrounding culture. I’m not saying it’s easy to live as a woman in the church. Too many times I have felt overlooked, unnoticed and haven’t wanted to voice my concerns about the involvement of women in case I have been labelled as just another angsty woman. The fact that that’s even a possibility angers me. I fail to see why standing up for women teaching, going against the status quo should earn anyone a label. Sure, we should be doing this in the most godly way possible but the hard things still need to be said. I am hurt and upset when my husband and I lead something together and because he’s the man, other men ask his opinion, ignoring me and assume I’m the helper, not actually the person with considerably more ministry experience than him (he’s pretty confused by this as well). In the midst of all this I have to embrace the call to forgive and love. Thankfully this hasn’t always been my experience, I have come across many men who have listened to me with respect, have learnt from stuff I’ve said, who’ve not dismissed me or labelled me as ‘emotional’ or ‘angsty’. I hate the fact that this isn’t always a normal experience but I know that we all fail to love well and I want to be generous in my response, as well as challenging when that is abundantly necessary. I’m utterly glad and delighted that I worship a God who delights in me as a woman, who listens to me with respect, who loved hanging out with women when he was down here and who clearly comes into the category of being a feminist. That reassures me on the dark nights when I worry that women are still so looked down on and patronised by the men around them. We have a God who is entirely different from that and it’s worth the fight to see that. Your correspondent, realising that she’s pretty OK with the feminist label after all, despite how misunderstood that word is. After all, “Christian” is a pretty loaded term these days as well. It’s odd, isn’t it, how the word “emotional” has such negative connotations. Our culture assumes that logic, rational thought, and the mind are superior to intuition, feelings, and the heart. But that’s a very skewed vision of what a human being is. I would like to redeem the word “emotional” to have positive connotations – meaning in touch with yourself, sensitive to others, balanced. Wouldn’t it be wonderful if it was used as a compliment, rather than with pejorative intent? I wish the church could be brave enough to lead the way in feminism, to be a place where women are valued and respected and listened to in a way that they aren’t generally. Where motherhood is seen as a high calling. As you say, the church doesn’t have a very good track record, but that doesn’t mean we can’t keep trying. Hey Lota, love the idea of reclaiming the word ’emotional’, to give someone dignity for being intuitive, aware of the swirl of emotions that go on inside us most of the time rather than dismissing them or squashing them down. Really interesting post. Always good to hear a different perspective. Certainly good to see more and more women embracing the feminist label I think. I feel concerned that it’s seen as a dirty word at times. Without feminism we would not have even the basic right to vote and so surely it’s something that should be celebrated by women rather than shunnned. 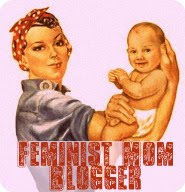 I’m also really excited about the Feminist Friday link and look forward to reading the posts of other feminist bloggers. Yay! Gappy recently posted..Are You Mom Enough? Of course you are. Thanks for helping bring Feminist Friday out of hibernation!